On May 1, 2015 I saw a high school-aged protester dragged by her hair across the pavement by police in riot gear. As a photographer who has covered political demonstrations in Montreal over the previous year, I’ve witnessed dozens of disturbing instances of the Service de Police de la Ville de Montréal using excessive force against otherwise peaceful protesters. 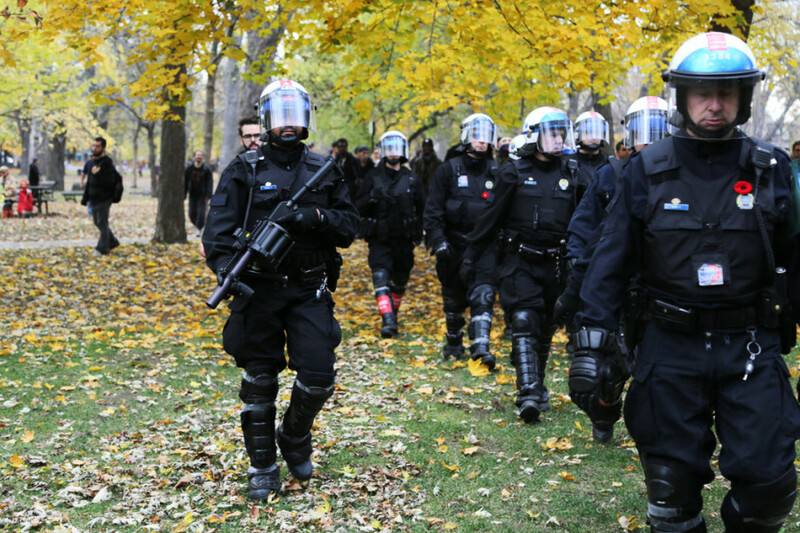 Since the anti-austerity movement began in earnest last spring, at least 13 student-organized protests were forcefully dispersed by police, at least 50 arrests were made and at least 214 fines were issued by the SPVM, as reported by The Link. I have seen police batons swung with malicious intent at harmless demonstrators, medical volunteers shoved as they attempted to treat injured protesters, dozens upon dozens of rounds of tear gas lobbed, often for no discernable reason, children treated for tear gas exposure, a grocery store fill up with tear gas as the check-out clerk woefully scanned products with her shirt over her nose—and I’m convinced many have seen much worse. As the high frequency of police intervention in protests demonstrates, the widespread and frighteningly predictable nature of the SPVM’s use of violence is, in this photographer’s opinion, not the case of a few bad apples who lose their cool every once in awhile—it’s much worse than that. It’s a culture of excessive violence against peaceful political demonstrators inherent in Montreal’s police force. Political repression has become normalized in a public institution that is expressly tasked with protecting the safety of its citizens, regardless of their political convictions. Robert Young, a Concordia student who has participated in several demonstrations that have been dispersed by the police, argues the SPVM are needlessly suppressing political expression. “The point is to throw everyone off-balance, it’s to have a thin pretext for shutting down the whole thing. It’s so obviously about political repression rather than the rule of law, it’s a sham,” Young said. Although it often is by many who have attended demonstrations in Montreal, it should not be expected that a protest will be met with needless police violence. Around 3,000 students and supporters marched through the streets of Downtown Montreal on Thursday Nov. 5, 2015 to denounce the Quebec Liberal government’s austerity measures. 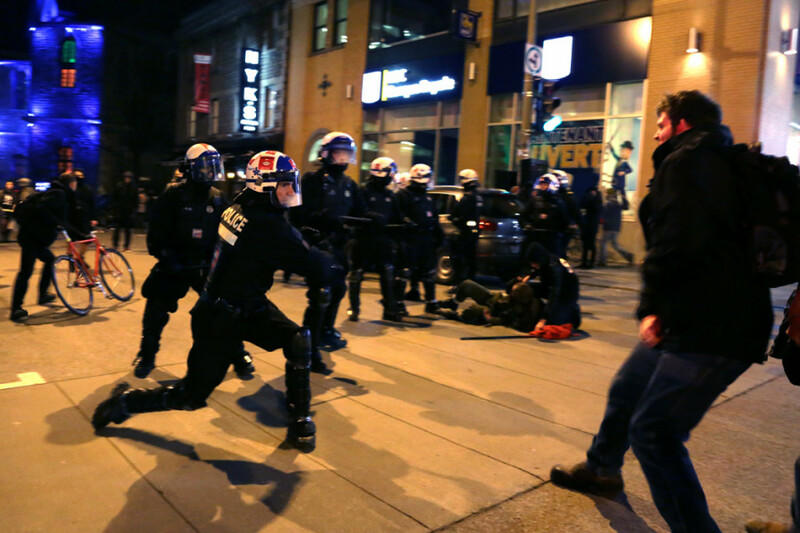 In an interview with Le Devoir last October, Philippe Pichet, Montreal’s chief of police, gave a statement regarding the SPVM’s use of dispersion tactics during protests. “When I think the security of the populace is in danger, I then make a decision [to intervene],” Pichet said. Despite Pichet’s rationale, the police are placing a vastly greater number of citizens’ safety in jeopardy when they choose to disperse a protest with violent tactics. Nobody deserves to be bashed with a baton, suffer the effects of tear gas or face enormous unconstitutional fines under the P-6 bylaw because they are attempting to practice the fundamental, constitutionally protected democratic right to assemble and petition the government in the streets. Undercover police infiltrating demonstrations is not a new tactic for Montreal police, and is another obstacle in exercising the right to assemble. On Dec. 18, several undercover SPVM officers pulled a gun on protesters, chased The Link staff and assaulted a Concordia student. When a culture trait becomes as pervasive and ingrained in an institution as violence has become within the SPVM, it becomes difficult to reverse without a fundamental change in the way that officers conduct themselves—but that’s exactly what must happen. The SPVM must be held to a higher standard of accountability. Officers, but more importantly, officers who give the orders to intervene violently, should face consequences, enforced by an independent and accountable public body if they continue to demonstrate the current callous level of disregard for the safety of Montreal citizens.